Russia has offered to host a reconciliation meeting between Hamas and Fateh in Moscow, Lebanese newspaper as-Safir reported Monday. The offer was reportedly made by the Russian Deputy Foreign Minister Mikhail Bogdanov, who is also the Russian President’s Special Representative for the Middle East. According to as-Safir, Hamas had accepted the invitation while Fateh movement had not yet given an answer. The report added that Russia is also waiting for an official request from President Mahmoud Abbas to host another meeting between other Palestinian factions. Palestinian sources told the newspaper that accepting the Russian offer would solve the question of where to hold negotiations, though other officials said that the matter was more complicated. 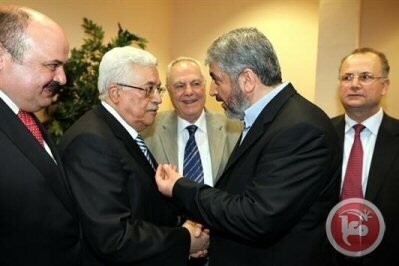 Hamas previously agreed to meet with Fateh in Cairo, but arrangements ground to a halt after Egypt vetoed the attendance of Hamas politburo member, Khalid Mashal, whose attendance Hamas insisted on. Relations between Hamas and Fateh remain in a dire state a year after a government of national consensus was formed in June 2014, Ma’an News Agency further reports. Last week, the deputy head of Hamas, Ismail Haniyeh, said the unity government had not brought any humanitarian or economic progress to the Gaza Strip since it was formed. He said that Hamas had hoped the formation of the unity government would bring an end to Palestinian division, but that it had so far failed in all its objectives. Following a high-profile visit by government ministers to Gaza that ended in disarray in April, Minister of Labor Mamoun Abu Shahla said that the unity government had severed all contact with Hamas. Russia, which is widely involved in Middle East politics, has long sought to maintain good relations with both Palestine and Israel. According to British think-tank Chatham House, the main goal of Russian activity in the region “is to exact leverage over the West, as Moscow’s assistance may play a crucial role in the settlement of major issues,” including Iran’s nuclear program and the Syrian conflict.